The Concept Development phase involves securing sufficient advance funding commitments for a project. Once definitive funding sources have been identified, the incorporation of tax credit equity into the project’s financing may be modeled. Tax credit equity can fund from 10% of a project’s total cost to almost one-half – depending upon project size and the types of tax credits for which the contemplated project is eligible – but this equity is best viewed as the “last dollar” added to a project’s capital stack. When a for-profit development is contemplated, the use of tax credit financing can significantly improve the project’s return, but tax credit equity usually cannot, by itself, transform an unrealistic project into a feasible one. Crescent Growth Capital has employed federal and state New Markets Tax Credits, federal and state historic tax credits, and state live performance tax credits to help finance projects on behalf of its clients. These projects have often utilized other non-traditional funding sources as well, such as Community Development Block Grants (“CDBG”) and FEMA dollars. During Concept Development, Crescent Growth Capital assists its clients by determining whether and what kind of tax credits can be employed. CGC will also model the proposed financing, to quantify an estimated net benefit that the project may derive through the use of tax credit equity. Should the project be suited for historic tax credits, CGC will prepare a nomination to the National Register and/or submit Historic Preservation Certification Applications, to secure a project’s eligibility for historic tax credit equity. Other tax credit applications, such as for Live Performance Infrastructure, may also be prepared and submitted by CGC. Though the securing of a project’s primary funding sources – as distinct from tax credit equity – is typically not the role of Crescent Growth Capital, CGC’s principals are willing to assist project sponsors by preparing descriptive documentation for presentation to investors and lenders. CGC also stands ready to accompany project sponsors to underwriting meetings with investors and lenders, to help these parties better comprehend the contemplated tax credit financing, or use of tax credit equity. With the completion of Concept Development, a project can achieve Financial Closing in as little as 60 days, depending upon project preparedness. Once primary funding sources have been identified and parties to the contemplated transaction are broadly comfortable with its proposed structure, Crescent Growth Capital will finalize the tax credit equity component of the project’s capital stack. If the contemplated financing will employ New Markets Tax Credits, CGC will market the transaction to potential Community Development Entities (“CDEs”). CGC will help secure tax credit investors and/or buyers and will generate models depicting cash flows to and from all parties to the transaction, for at least as long as the applicable compliance period (seven years, in the case of NMTCs). Crescent Growth Capital will also advise on transaction term sheets and will coordinate and supervise legal documentation via detailed closing checklists. Finally, CGC will prepare Flow of Funds memoranda, to instruct the parties to a transaction as to which accounts funds will be directed, and in what sequence, to effect the financial closing of a transaction. Only upon financial closing, and as part of the flow of funds, will CGC collect payment for its services, in the form of an Arranger Fee. Project Sponsor – The lead developer for the project. Crescent Growth Capital assists by modeling the project's financing structure as well as initiating and/or supervising negotiations of financial terms among all parties to the contemplated development. Tax Credit Investor – Frequently a bank, the tax credit investor’s purchase of the tax credits generated by the project creates tax credit equity. 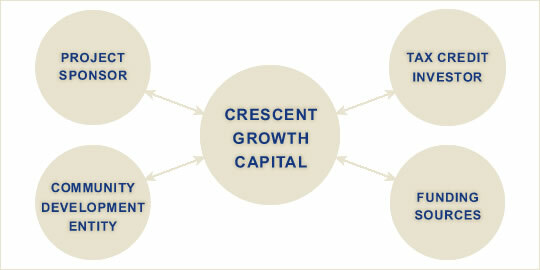 Crescent Growth Capital assists by ensuring that the project’s financial terms and conditions are acceptable to the tax credit investor, or by locating a suitable tax credit investor for the project sponsor. Funding Sources – A conventional loan, bond issue proceeds, government grants and/or non-profit fundraising dollars can be leveraged to generate tax credit equity. On behalf of its clients, Crescent Growth Capital models the incorporation of multiple sources of leverage to determine the value of a potential tax credit subsidy. CGC structures the combination of various leverage sources with New Markets Tax Credits so that the program requirements of each are respected and satisfied. Community Development Entity – Securing allocation dollars from one or more CDEs is essential to completing a New Markets Tax Credit transaction. Crescent Growth Capital relies upon well-developed relationships with CDEs in every corner of the nation to secure the best terms for its clients.